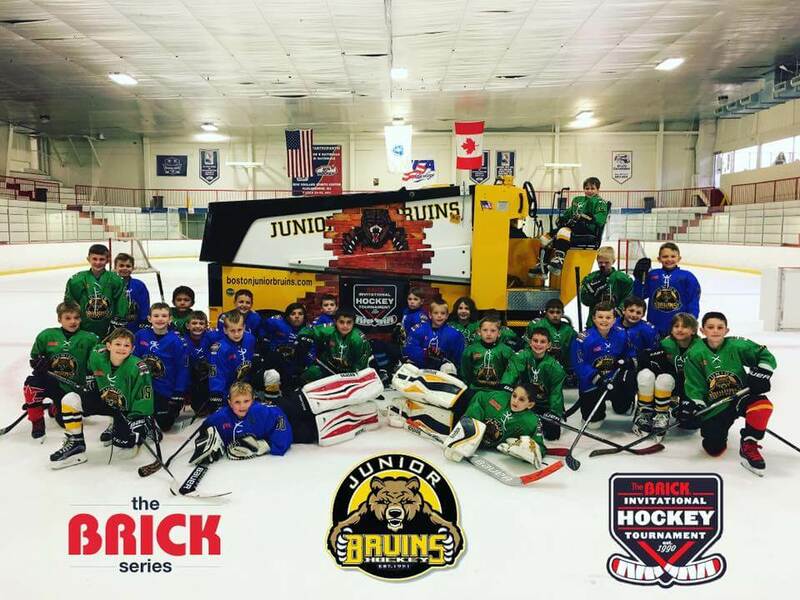 Duncan tried out for the 2017 Boston Junior Bruins Brick Series team in November of 2016. So, as a result of Duncan trying out for the 2017 Brick Series team and being named an alternate (though he never actually suited up), we were on the mailing list for the Junior Bruins program and received an "invite" of sorts to their Training & Evaluation Camp held in August on 2017. Good news, we're on their radar. So we signed him up and part of the process of the registration (which IS open to the public) is that they want to do some due diligence and limit the possibility of there being registrants that aren't up to the appropriate skill level. I wish more camps would do this. I have a feeling that the fact that we'd tried out the previous season, regardless of being called an alternate, expedited that for us. A couple of days later, he was confirmed "in" and they billed my credit card $395. On the first day, we checked in and headed to a private locker room (not a concrete box lined with benches) at the New England Sports Center where they had put up nice nameplates on the locker stalls and hung jerseys personalized with the kids' names on the back. Nice touch. For real, those little things go a LONG way. 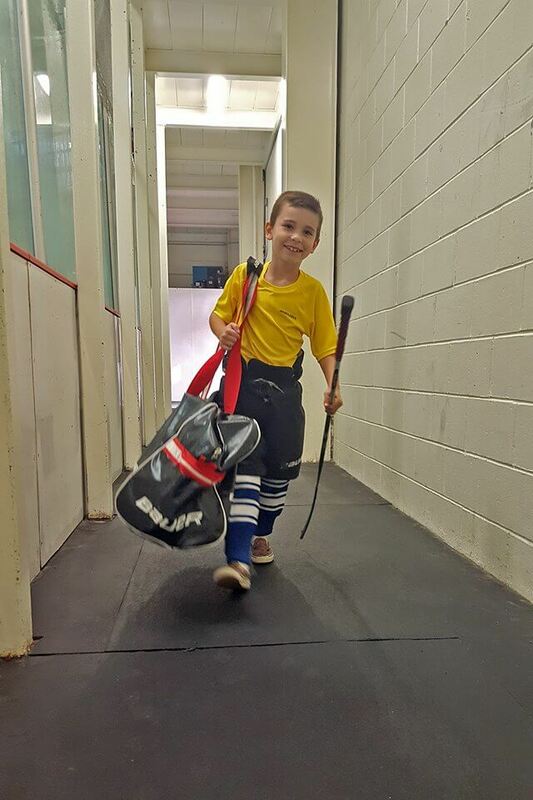 Every kid in that locker room felt like a pro, even the kids already sporting Jr Bruins gear from head-to-toe already, moments after walking in. 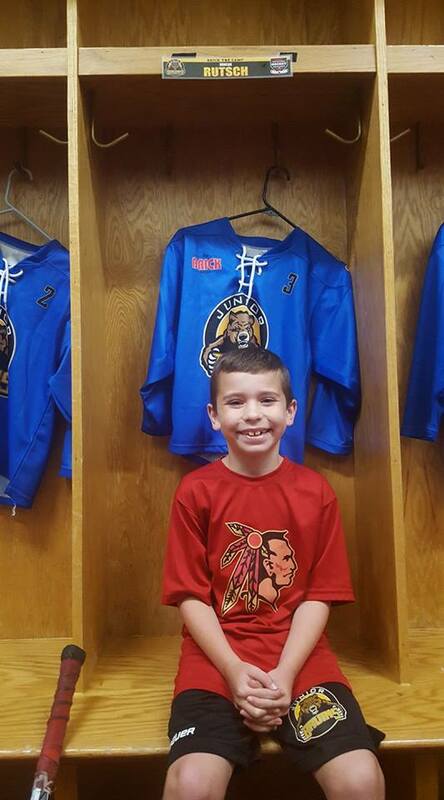 And speaking of the kids in full Junior Bruins garb, if you haven't read my review of the inital tryout we attended, now might be a good time. It's okay, I can wait. Click here to read it. Okay, so now, having attended this camp, the story behind the kids in full team uniforms at the first tryout we attended paint a clearer picture. 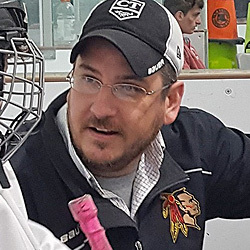 While not necessarily already on the roster, those kids clearly attended this training camp the prior summer and, as such, have a leg up on most of the competition that attends the tryout held in the Fall. So, on day one, they had all of the kids participate in some drills. Usual stuff, length of the ice warm up drills, weaving around cones, shooting on the goaltender, that sort of thing. What surprised me was the slow pace and low intensity. The drills were fine, standard stuff, and every last one of the kids running through them were clearly quite talented. But, my goodness, there was a ridiculous amount of standing in line. Where my kids play regularly and for the camps they attend, the lines are never more than 4 or 5 players. Idle time is hard to come by -- as it should be. Here, though, they'd have all 13 kids -- or for some drills, two squads -- line up and go one at a time. Most drills, the kids ran through them two or three times each. That's it. I mean, these are elite level players running through pretty simple drills. Nobody is going to get bunched up by the "slow" kid. That guy's not here...push the kids through at a rapid pace is all I'm saying. After a couple hours of downtime, the kids were back out on the ice for a full ice game against their counterparts -- their age group had two teams of 13 or 14 players each. No real coaching, three forwards racing to the dot to "claim" the center position for faceoffs, and yes, you guessed it, like the previous Fall's tryout, ZERO passing. Even among the kids wearing Jr Bruins gear from head to toe, more often than not, it was a one man show. Terrible hockey. Day two started with 3-on-3 cross ice games. Again, same teams but sent out, obviously, in groups of three as the teenage "coaches" rolled the lines and did their best to prevent kids from cutting in line. More of the same from day one. Zero passing, zero defense, and for the handful of kids that were probably great two-way players, well, they never got any touches. Kinda defeats the whole purpose of 3v3 cross-ice. I dunno -- it should be two-on-ones back and forth but it...wasn't. Even if a player was wide open and ready. After another break -- no off-ice instruction at all, by the way -- the kids were back out on the ice for another full ice game. In hindsight, I feel horrible. Those traits do not make a great hockey player...aside from in the eyes of some hockey parents who just don't get it, of course. At the same time, Duncan went from a player who'd had maybe one or two opportunities to carry the puck over the first half of the training camp to one who got some touches on every shift he took. Admittedly, he didn't look great but I couldn't expect much more considering he'd just been asked to play the game he knows is only effective in video games or against four year olds. Day 3, they split the squads up into opposite corners of the ice and had them line up in numerical order. Again, though, with a line 13 kids long, Duncan only had three runs in the drill where they were evaluating their shot power and accuracy. Worse, the pass he was fed while on his only attempt from his strong side (left) was slow, on his off side, and behind him. Let's just say he didn't get a lot on that shot. Even still, I knew he was toward the bottom of the depth chart when it came to shot power anyway so it didn't matter much but I'm not sure he was given a fair shake. Truth be told, I'm nearly certain he wasn't even aware he was being evaluated. The most rattling part for me, though, was it appeared that the ONLY thing being evaluated was each player's shot. We tried out for a team (which Duncan made but didn't accept) that had a tryout like that. Yes, goal scorers are very important. They want kids that can finish 99% of the time. I get it. Patrick Kane is awesome. Chicago would not have won any of those Cups without Jonathan Toews and Patrick Sharp, you know, guys that pass, play both ways, kill penalties and, oh, they can score goals too. There's a reason Crosby has more Cups than Ovechkin will ever have. I'd take Ovi in a shootout but, outside of that, Crosby all the way. So, following that shooting drill, and another shooting drill (lifting the puck) that Duncan never got the opportunity to take part in cause the line was so long, they had a skating and transitions drill (that Duncan dominated), and a little bit more 3v3 cross ice, they then took a neat group picture of both squads with the Jr Bruins wrapped Zamboni. Again, things like this are awesome and so, so simple to do. Kudos to whoever's idea that was. Great marketing. Then they set up for another 5-on-5 full ice game. His first shift, the second shift of the game, he poke checked the opposing defenseman (attempting to go coast to coast, naturally) in the neutral zone and found himself with the puck on his stick crossing the blue line on the left side without any defense (or teammate, thankfully) within striking distance. Duncan has a tendency to slow down when going in on a goalie -- we're working on it -- so I was worried that some of the stronger skaters would be able to get back and catch him, and then he took the most unusual angle in towards the goaltender which actually bought him more room. The goaltender, Kam Jackson, who I might add was the best goaltender I think I've ever seen at this age level (remember that name, folks), hugged the near post instead of coming out to challenge based on, I'd assume, where Duncan was coming in from and, being a lefty, probably expected Duncan to shoot forehand up high. Duncan didn't shoot though, instead, showing some rare patience, carried it through the top of the crease and slipped a backhand through the five hole and followed up with his ever un-imaginative Mark Messier style (two arms straight up in the air) goal celebration. First goal of the game. His next shift, he had two more solid scoring opportunities that, dare I say it again, he had to create himself. One shot went wide and another he was muscled into the side of the net. Solid way to end the camp, for sure, and though I knew he didn't present himself as a strong enough "Patrick Kane" type of player over the three days, and probably went unnoticed throughout, I was most proud that when he finally did get an opportunity, he buried it. 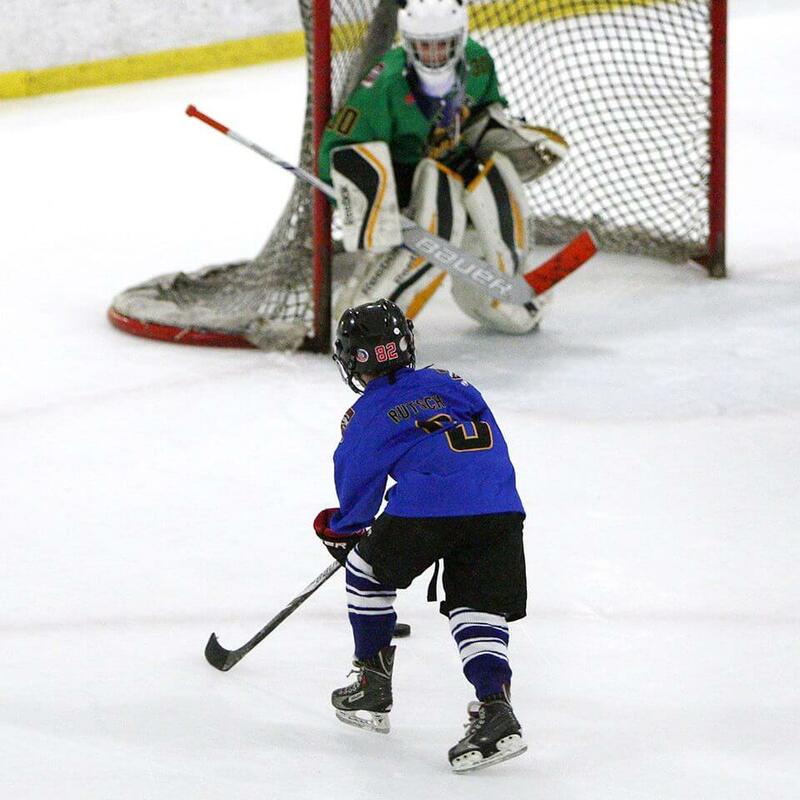 Sure, that one kid scored 10 goals over the course of the camp and had the puck on his stick more often than not, but he also launched 30 shots three feet over the net. My kid scored on his first, and only, shot on goal. But, frankly, I don't want him to be. Around a month or so after the camp, following a few delays, the team provided the results of their evaluation on Duncan. Parents could opt-out if they liked but I was having none of that. I love third party confirmation that I'm not wearing dad-goggles and that my own criticism of my kids' play is generally pretty spot-on. Now, as I've said, I knew the results would be less than impressive. I was there, I watched every second of hockey and could see that Duncan wasn't a stand out player in this crowd. I'm not thin skinned on things like this. Anyway, here's their evaluation of Duncan. 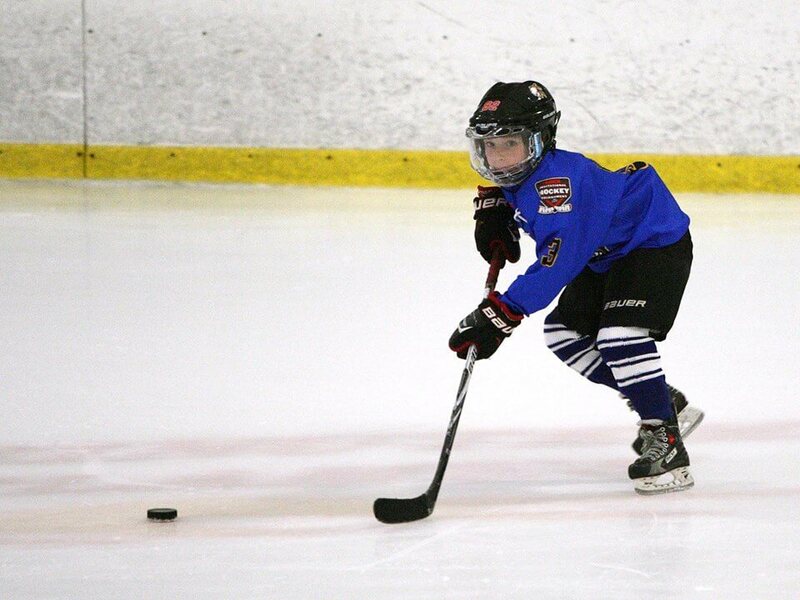 The evaluations are made comparing your son not to every player his age playing hockey but, rather, in the context of comparing him to the top 10% of the players his age. Please keep in mind, that regardless of what the Evals say, we feel your son/daughter is a strong player and we would not have allowed him at the camp if we felt otherwise. Comments: Player needs some work on his edges and balance. He has a straight up style of skating; he needs to be more athletic with knees bent. This will help with balance, power, and speed. Investing in some power skating lessons would be money well spent. We suggest some work with a power skating coach. 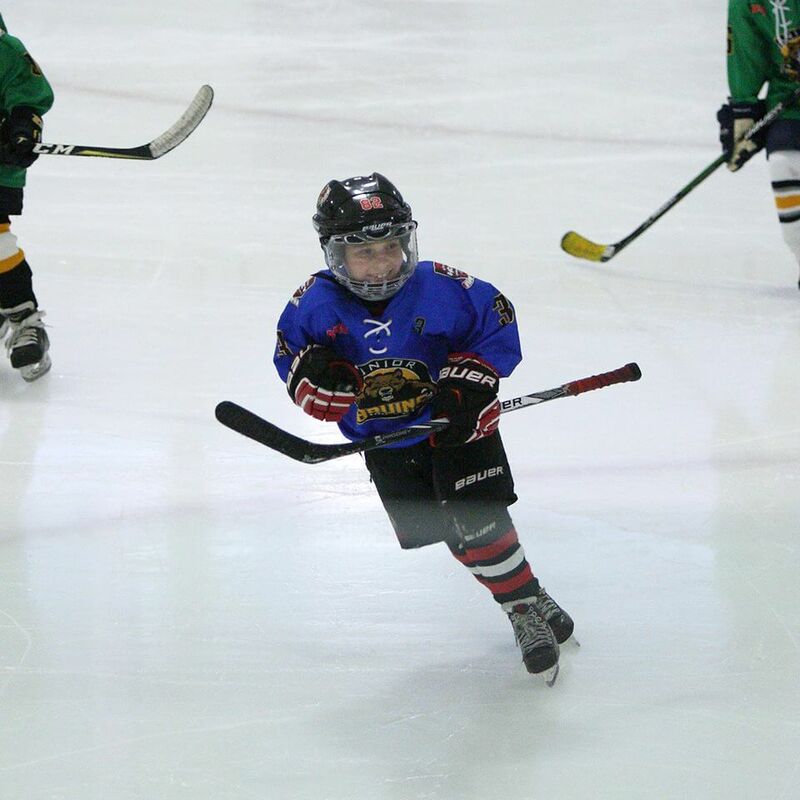 If he can lengthen his stride and make it more efficient he will be stronger on his skates, quicker, faster and more effective. Comments: Player is a good pass catcher. He rarely misses catching a pass. He is also a good pass giver. He just needs to be more consistent with giving hard accurate passes. Stick handling needs a little work; an improvement in his edges and balance will also help stick handling. Working at home for 30 minutes (4-5x per week) on his stick handling will go a long way to fix this correctable part of his game. There are some great training tools you can get online so that he can work on this at home. Comments: Player has a very accurate shot. We rarely saw him miss the net. The release is a little long; getting his hands away from the body will help with a quicker release. The power is of the shot is okay. Again, improving in edges and balance will help with the power. Any player who needs work on their shot can fix it in just a few months. Shoot 1500-2000 pucks each week at the house. You will be amazed at what this does to your shot in a short 3-4 month span. Comments: Player works hard and is competitive. His skating limits how many loose pucks he can win. Players needs a little work on game position. At times he got caught puck watching and drifted out of position. Player has good vision and tries to make the right play most of the time but just needs more consistency. He has a great base to his game...no glaring weaknesses but he doesn't do anything better than everyone else. He has a bright future and if the area's of his game that need work are addressed he can quickly move to being one of the elite players at his age. My take? It appears they rank him as elite...but in a fourth line type of role. Not a super star but I had no expectation of that. Regarding his skating, I don't think his edges are an issue -- he transitions better than most -- but he definitely straightens up way too much. He also has a length and strength issue which I hope solves itself on its own as he gets older. Poor kid lacks height and he just doesn't push as hard as he should be able to. He worked with Sasha Malkov for six or seven weeks over the summer and that greatly improved his starts and his arm swing but the tendency to stand up still remains. Definitely sound advice from the evaluators. His stick skills all fall in the average range. I expected that. He's always passed the puck well but, like all kids this age, is susceptible to those wimpy, what-were-you-thinking, softies now and then. Stickhandling is there...it's just a confidence issue. He saw a few of the kids out there putting on a clinic and knew he didn't stack up...and stumbled and bumbled his way into cones during the evaluation. This should be easy to correct by playing in pick-up games with less skilled players (an opportunity he's seldom privvy to) -- simply to boost his puck carrying confidence. I think they may have been watching the wrong player when evaluating the shot -- or maybe Duncan was blessed that he didn't get a chance to showcase his (then) inability to lift the puck with power. In my opinion, Duncan's biggest shortcoming on the ice is his shot. For years, he's shot off of the wrong foot -- mimicking what professional players do so casually in warm-ups -- and he lacks the arm strength to get enough power behind the shot without using any other part of his body besides his arms. Yeah, it's a quick release (their rating and comment contradict one another a bit), because his 'only' shot is a snap shot. He doesn't pull it back like everyone else does on a wrist shot...because he's already on his inside foot. Terrible, terrible habit. It's 100% wrong. At the same time, once that arm strength develops, look out -- this kid's been working on the snap shot from the wrong foot since he was 4 years old. The upside is that, if you've been following us on Instagram, we've already been heeding their advice by shooting pucks (the weighted kind) relentlessly at home. In a matter of days (and over 1000 shots), not only have we mostly fixed the tendency to shoot off of the wrong foot in most cases, but we've also made those black pucks feel more like blue pucks. The shot is a very easy thing to work on and improve. And I'll agree with their evaluation of his work ethic and competitiveness. He does work hard and doesn't fool around on the ice at all and tells as much to players around him who aren't taking it as seriously as he is. Coachable to a fault at times where, in the past, he's tried to do something a right handed coach shows him right handed...even though he shoots left. Sometimes I also think he lapses on the game situation he's in -- things like not having an awareness of how much time is on the clock (just pin it the corner!) or playing a defensive style when his team is down a few goals. Positionally, though, it was my un-coaching at work that landed him his lowest mark. On day 3, he was all over the ice. Everywhere, just desperately trying to get the puck like I'd told him. Regularly, he's pretty good about playing his side, opening up to the puck, and getting ahead for a rush out of the zone...but they nailed it when they said, "His skating limits how many loose pucks he can win." 100% true. And if he's the last wing to enter the zone, he has a hard time catching up to the play or getting to the net quickly enough. I'm perfectly content with the evaluation -- almost exactly what I'd expected. Duncan has played "up" since he was 6 years old and continues to play up. When that trend comes to an end, which I'd expect next season, I want him to have the competitive advantage, as well as new found confidence, to be a major force on his new team after having played against stiffer competition for so long. The camps and tryouts with the Junior Bruins have shown me that, even though he has a deservedly limited offensive role on his current team, he can skate with the best of the best in his own age group and not be a liability. All said, we'd do it again. He left the camp covered with sweat and smile on his face. Almost a sure thing that younger brother Henrik will follow suit in August of 2018. » Dirty Players: Can we stop with all the Slashing? Agree? Disagree? Let me know -- I love the feedback from all angles! Year round, I spend a significant amount of time and money transporting my three boys to and from freezing cold ice rinks. Not because I expect them to make it to the NHL but because I know the rigorous youth hockey experience will serve them well in the future.